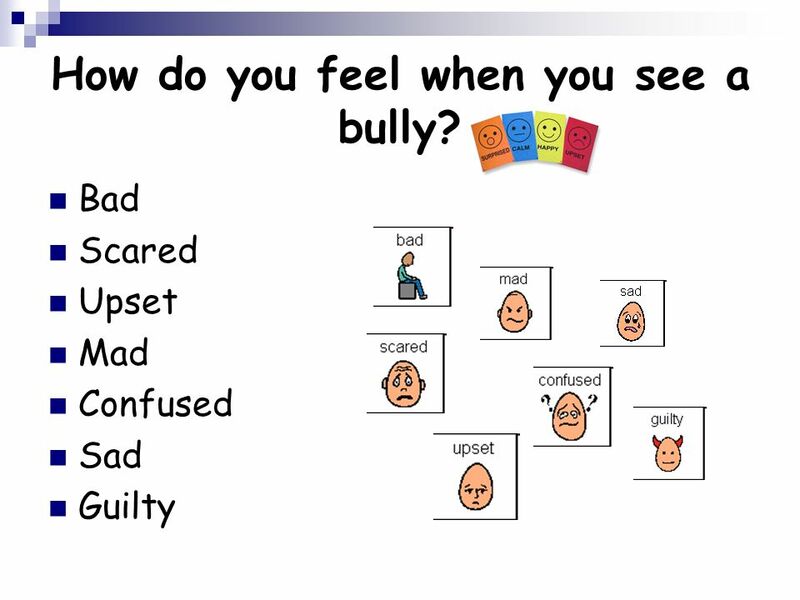 3 How do you feel when you see a bully? There’s a better chance the bully will listen. Watch first video clip. 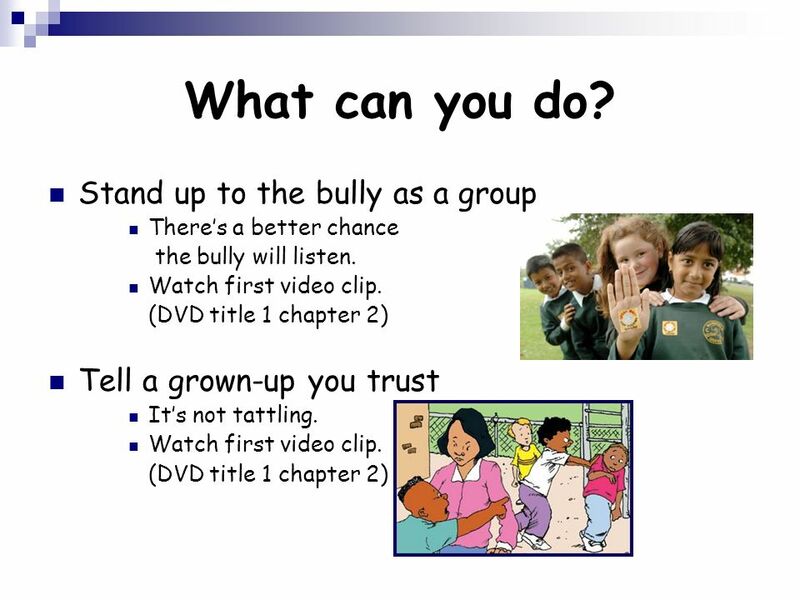 (DVD title 1 chapter 2) Tell a grown-up you trust It’s not tattling. 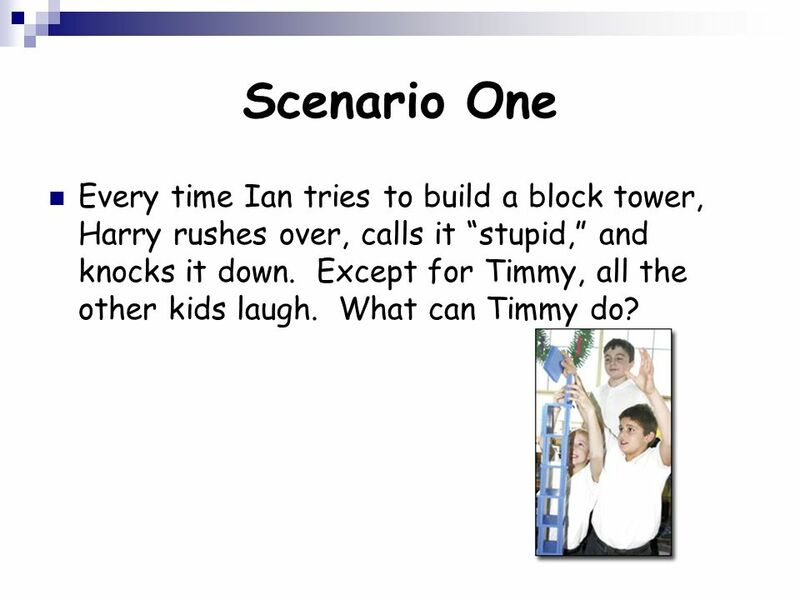 6 Scenario One Every time Ian tries to build a block tower, Harry rushes over, calls it “stupid,” and knocks it down. Except for Timmy, all the other kids laugh. What can Timmy do? 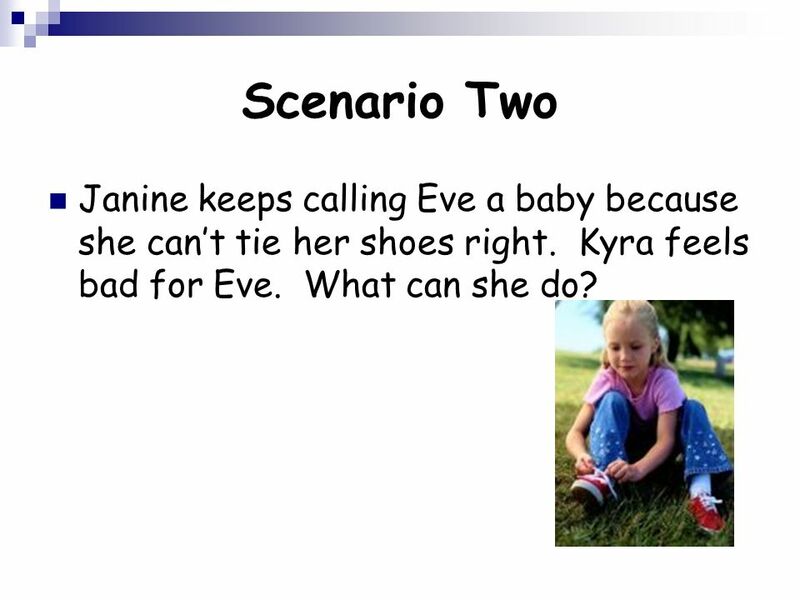 7 Scenario Two Janine keeps calling Eve a baby because she can’t tie her shoes right. Kyra feels bad for Eve. What can she do? 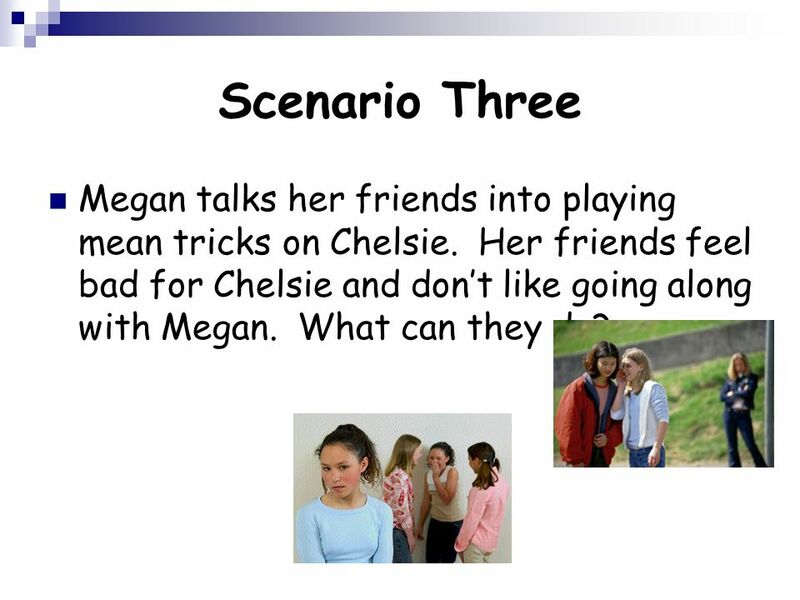 8 Scenario Three Megan talks her friends into playing mean tricks on Chelsie. Her friends feel bad for Chelsie and don’t like going along with Megan. What can they do? 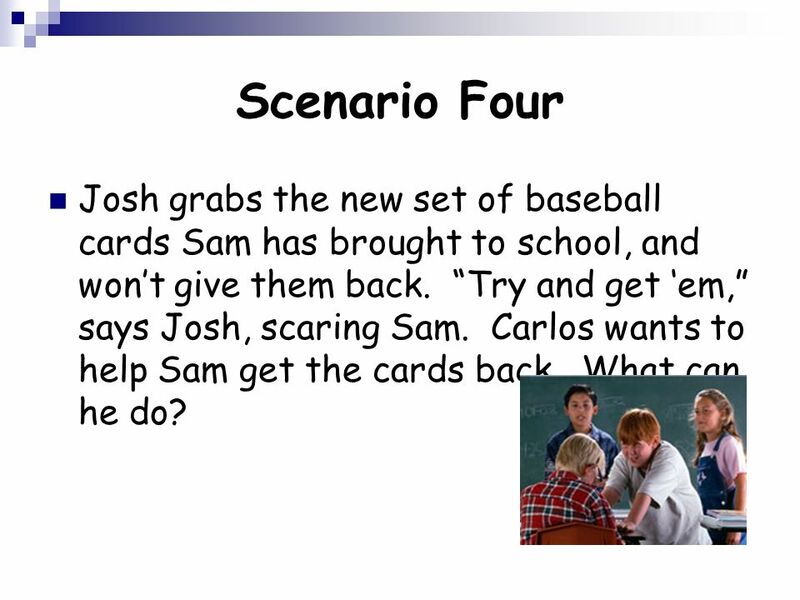 9 Scenario Four Josh grabs the new set of baseball cards Sam has brought to school, and won’t give them back. “Try and get ‘em,” says Josh, scaring Sam. Carlos wants to help Sam get the cards back. What can he do? 10 Scenarios Group 1 Group 2 Every time I an tries to build a block tower, Harry rushes over, calls it “stupid,” and knocks it down. Except for Timmy, all the other kids laugh. What can Timmy do? Janine keeps calling Eve a baby because she can’t tie her shoes right. Kyra feels bad for Eve. What can she do? Group 3 Group 4 Megan talks her friends into playing mean tricks on Chelsie. Her friends feel bad for Chelsie and don’t like going along with Megan. What can they do? Josh grabs the new set of baseball cards Sam has brought to school, and won’t give them back. “Try and get ‘em,” says Josh, scaring Sam. Carlos wants to help Sam get the cards back. What can he do? 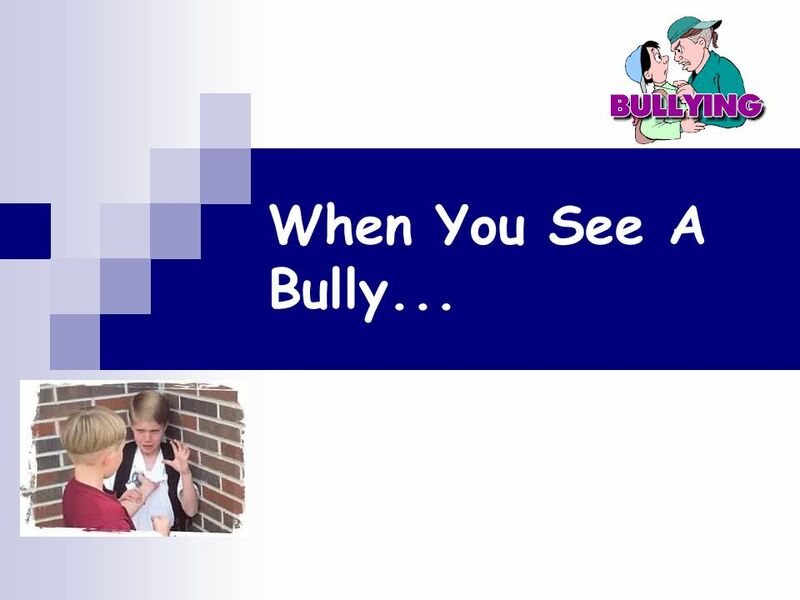 Download ppt "When You See A Bully...."
SEN Knowing and Growing Confused Claire Presentation. SAFETY EDUCATION. Building Stronger Kids Choices They can make decisions Listen and respect what they say Saying No - encourage them to set limits. Anti Bullying Pupil Survey 2013 Tell us what you think? Anti Bullying Annual Survey 2013 Tell us what you think? CONNECTING WITH OTHERS. Connecting with others SUPPORTING A FRIEND Helping yourself Identify trusted friends and adults who may be able to support you. Steps to Respect Bullying Prevention Program. Respect What does respect mean? -Treating people the way you want to be treated Do you need to treat people. HOW TO DEAL WITH BULLIES. 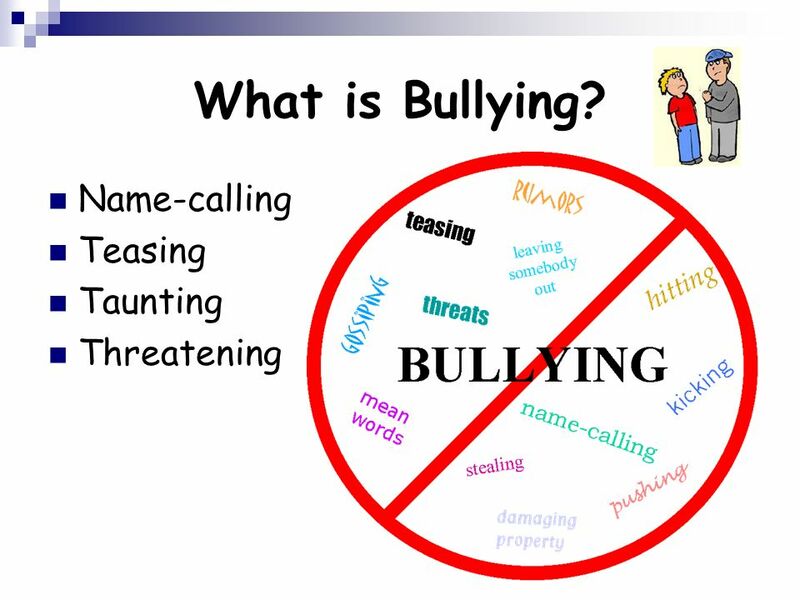 ESSENTIAL QUESTIONS  What is bullying?  How can I help other people who are being bullied?  How can I help myself if I am. The 3 R’s Recognize bullying. Refuse bullying. Report it to an adult. Wrap it up A quick review of Key concepts. Students should recognize: The difference between harmless teasing and harassment Different types of harassment. BE S.M.A.R.T. ABOUT BULLYING Poughkeepsie City School District. 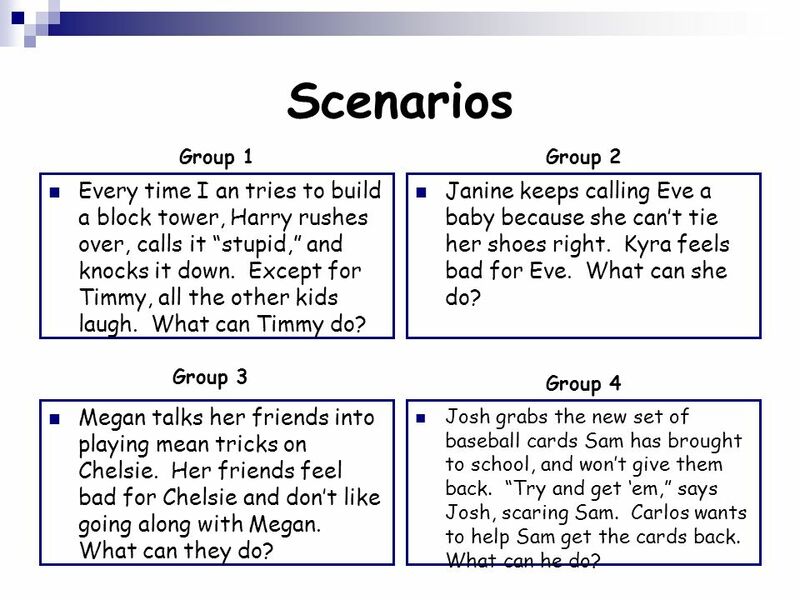 Let’s Talk About Bullying Introduction. 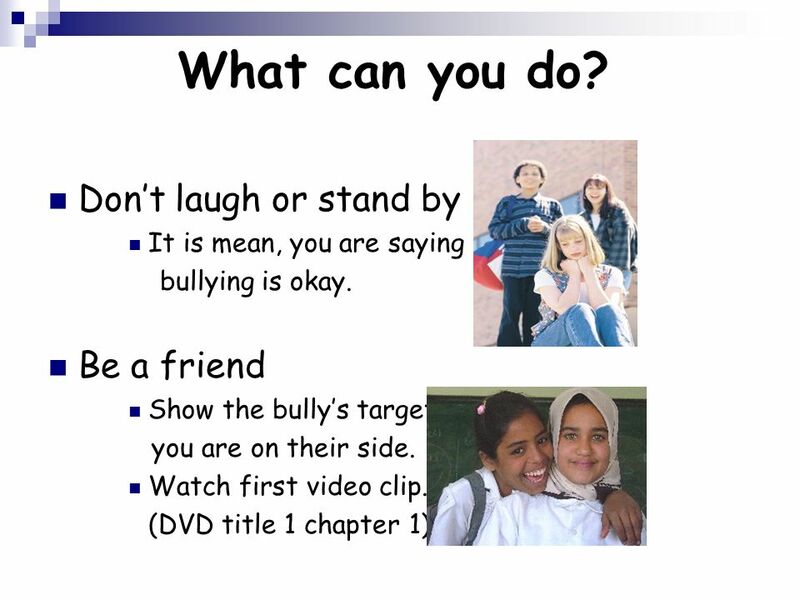 We are going to talk about bullying and what we can do to stop it. What is bullying? What are some examples of.